Apple has just updated its U.S. online store with an offer of selling unlocked SIM-free iPhone 5s models. This is the first time Apple is officially selling unlocked devices without SIM cards. Although previously, carrier-locked models sold by Apple have been unlocked all the time, this official unlocked SIM-free iPhone 5s offer though is the first from Apple. These iPhone 5s models can be purchased in United States and are currently on sale with same prices as the unsubsidized iPhone 5s sets. However, delivery dates range from one to two weeks as opposite to the standard 3-5 business days shipping for carrier bound iPhone 5s models. You can get the Apple unlocked iPhone 5s for $649, $749, and $849 for the 16, 32, and the 64 GB models respectively. The Apple unlocked SIM-free iPhone 5s model is the best for those users who either travel a lot or want to gift it to someone not residing in America. This new Apple unlocked SIM-free iPhone 5s availability will also free you up from any contract blahs. No more sticking to one carrier for two years and so on. As these iPhone 5s models carry same features and capabilities like the locked Apple smartphones, it is a option worth looking for. 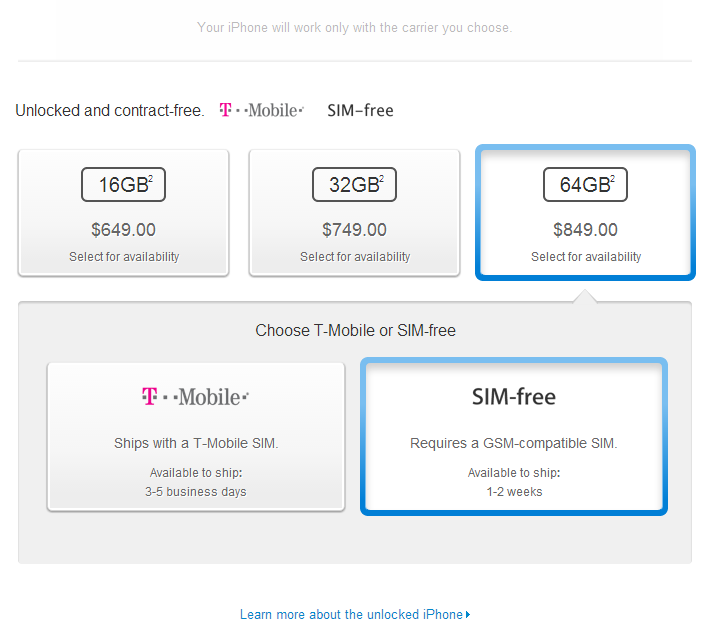 Previously, Apple has sold unlocked iPhone 5s models for T-Mobile. However, those models included T-Mobile SIM card and tied the phone to a T-Mobile account. With this new release of Apple unlocked SIM-free iPhone 5s models, there wont even be any SIM cards attached. These models are SIM-free, completely unlocked, and carry same features as before. The device model is A1533 and is compatible with GSM networks.